Home • More Magic • Why go to Lapland for Christmas? Any holiday to Lapland is an amazing experience for the whole family that heightens the enjoyment of the Christmas period for the children when they come home. For those lucky enough, it is an amazing way to spend Christmas day. There are some companies that try to offer this experience with a one day excursion but we believe this packs too much into one day for anybody to get the most out of this amazing area. With a three and a half hour flight and check in either side of the flights taking anywhere from 1 to 2 hours, this means that you are spending between five and a half to seven and a half hours travelling! We believe the best option is to go for a minimum of two nights/three days as this allows plenty of time to enjoy what Lapland has to offer and to meet Santa. 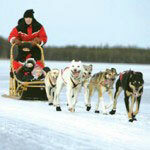 One of the great things about Lapland is the variety of activities on offer for the whole family which makes the experience that much more enjoyable e.g. 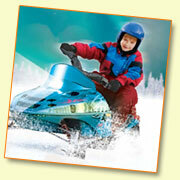 husky dog sled rides, reindeer led rides, snowmobiling. Some other companies may advertise a lot of activities to participate in but they may not actually include them in your booking, so check what you get when you book with us, see our example here. It is also worth reading up online or in travel articles about any other activities that you may be thinking of taking part in as this will help to make this once in a lifetime holiday even more memorable. We find that the most popular additional activities are to see the Aurora Borealis (the northern lights), driving snowmobiles, cross country skiing or downhill skiing. As we do not want to determine how you use all your time on your holiday, we have arranged with our local suppliers to provide special rates for our guests if you want to do something extra. All bookings for extra activities can be made in advance or in resort but we would recommend booking in advance to avoid missing out. If you are considering visiting Lapland this Christmas, we have offers that are available for booking early such as these. If you are planning to wait until closer to the time to get a last minute deal it is worth remembering not to leave it too late as these holidays are popular and can sell out well before the Christmas period. Of course, the highlight of any Christmas time Lapland visit is visiting Santa Claus. We have arranged it so that you can have a private meeting with Santa in his hidden log cabin, only finding it with the help of our Elves who will guide you there on snowmobiles. For all booking queries, please contact our friendly and knowledgeable reservations team on 01483 791945. Alternatively, like us on facebook , send us a message, and we will get back to you as best we can.